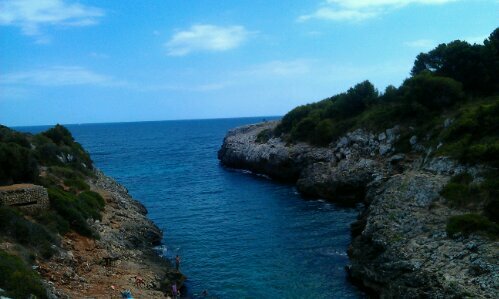 First we stopped at Porto Christo at the dragon cave. But as they wanted 14€ per person and there were bus loads of people queuing we quickly decided against going in. It is probably nice there if you are into touristy stuff with lots of people around that is. What we did was going for a quick walk which rewarded us with a view of the bay underneath. 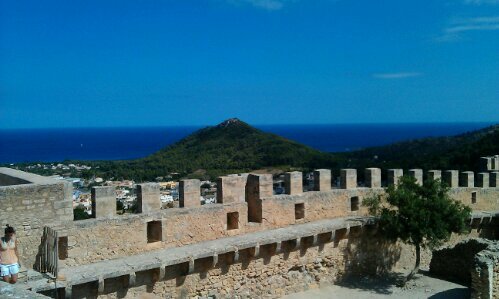 We now drove to Capdepera, a cute little town near Artá with a small castle on top of a hill, that we visited. There weren’t much more people and it seemed to me that only Germans make their kids visit historic places in the afternoon heat as no other language speaking families where around. It is high enough here that you can see quite a few miles inland as well as to the coast. 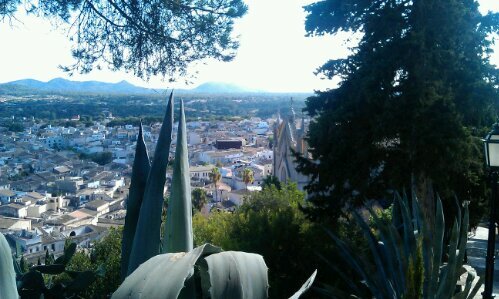 They say you can even see Menorca on very clear days. In town there must have been some country fair on the weekend but as they were already cleaning up there wasn’t much to see anymore. Next we went to Artá where tonight a fire burned square miles of a nearby national park. Luckily we were already home when the fire started. Artá is situated on a hill as well and has a church half way up and an old castle turned church on top of the hill known for the wondrous healings they attribute to a special statue of the Mother Mary. Other than that there isn’t much to see in Artá either so we were ready to leave after an hour and drove back to Santanyí where we had dinner. We chose the restaurant from a magazine called “Mallorca geht Aus” which lists all the (seemingly) good restaurants on the island. The “Es coc” where we went was very high rated but to be honest while the food was ok and the waitresses very nice and friendly it was rather pricey and lacking some basics as e.g. completely clean plates or a cobweb free interior. We finished the evening with a short walk through town before we headed home to the Finca. 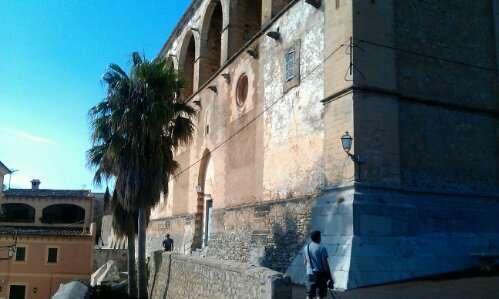 This entry was posted in Spain and tagged Arta, Capdepera, History, Mallorca, Ruins by kathatravelling. Bookmark the permalink.